Today we've decided to examine the role flowers have played in some of the most iconic films of the past century. Employed as evocative visual motifs, flowers can be used for both their powerful metaphorical potential and arresting visual presence. We've selected five of our favourite films which feature flowers prominently and looked at how flowers have been used to convey the overall themes and ideas of the film itself. Alfred Hitchcock's undisputed masterpiece uses flowers as a central motif to indicate the fragility and beauty of one of the main characters, Madeleine. Hitchcock used a small Nosegay which is a small flower bouquet traditionally given as a gift. The flowers reappear frequently throughout the film - in one powerful scene Madeleine is depicted at the edge of the San Francisco Bay, pulling petals from the flowers and throwing them to the water. This scene is thought to represent the state of mind of the character and her self-destructive intentions. Following Madeleines' death, the protagonist Scottie has a nightmare involving a garishly colourful animated bouquet of flowers which disintegrates, signifying the death itself. Later in the film, Scottie gifts Judy with a single flower, returning to the floral theme but this time substituting the bouquet with a single flower. This is significant - Judy does not exemplify Madeleine's perfection as embodied by the earlier motif of the full bouquet, but rather a smaller aspect of it. On a less serious note, there is also an amusing continuity goof contained within this film involving flowers - in the scene where Scotty purchases a flower for Judy from a street vendor, there is a cut to a studio closeup of them that includes a large bunch of purple carnations. When the scene returns to the location shot the flower bunch is no longer there however! The inner desires and simmering passions of the protagonist Lester Burnham are powerfully represented using the visceral beauty of red roses in Sam Mendes modern classic, American Beauty. The rose is used as a representation of the films title itself and is employed heavily throughout to convey the metaphor or, well, beauty in all its Americaness. Perhaps one of the most memorable sequences in the film depicts the alluring, unattainable Angela being envoloped in roses whilst another scene finds Carolyn clinically grooming and snipping roses, possibly symbolising the neutering and sterilisation of passion itself. Floral related continuity goof time! Whilst cutting American Beauty roses in the opening scene of the film, Carolyn snips the first one about four inches below the stem. A moment later the flower looks to be at least a foot long! Acclaimed indie director Jim Jarmusch opted to use flowers as a central motif in his 2005 comedy Broken Flowers. This film stars Bill Murray as a Don Juan style character who embarks on a journey across America in search of the mother of his son after receiving an anonymous letter. He visits four former flames to try to determine who might have sent him the letter and brings each a bouquet of flowers. The title of the film itself indicates a lot about the themes of the film - disappointment, rejection and romantic failure. In one scene wilted flowers are used to indicate the passage of time as well as to suggest withered beauty and ageing. Onto an eerier tip now, the unsettling sci-fi film based on the post-apocalyptic novel of the same name uses flowers as a far more overtly menacing and sinister symbol than any of the other films on our list. The triffid is a fictional flower - tall, mobile and highly venemous! Whilst flowers are often used as a symbol of beauty in films, whether vivid and fresh or withered yet still elegant, the Day of the Triffids opts for a much more chilling take on nature. The film essentially presents a pessimistic view of evolution and natural selection, warning us of our own naive complacency as a civilisation. The Day of the Triffids shows that flowers can be used not only as inspiration in comedies or dramas but also as a unique and interesting device in a horror film. Such is the broad and powerful symbolism inherent in flowers. There are a number of entertaining goofs in this film including scenes where the wires and wheels used to convey the triffids are clearly visible, whoopsy! Our favourite flower based film has to be Spike Jonze 2002 comedy drama, Adaptation. 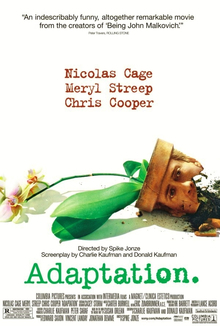 Penned by the wildly imaginative Charlie Kaufman and featuring inspired performances from Nicolas Cage and Meryl Streep, Adaptation is an excellent film which uses Orchids as a recurring motif. The film centres around a neurotic screenwriter as he attempts to write a script for a film about flowers. This 'film-within-a-film' scenario becomes increasingly surreal and also profound as the characters philosophize on how flowers and plants adapt to their natural environment and how we as humans struggle to do so "What I came to understand is that change is not a choice. Not for a species of plant, and not for me." The protagnoist laments over the fact that it's easier for plants and flowers to thrive in this world as "...they have no memory. They just move on to whatever's next. With a person though, adapting is almost shameful. It's like running away." The orchid is seen as something as seductive and alluring, when quizzed as to why this might be so, one of the characters suggests "Mystery, beauty, unknowability, I suppose." And so concludes our list of our five favourite floral themed films, we hope you've enjoyed it and we now invite you to share with us your favourite from the list - or suggestions for your favourite that's not on here!